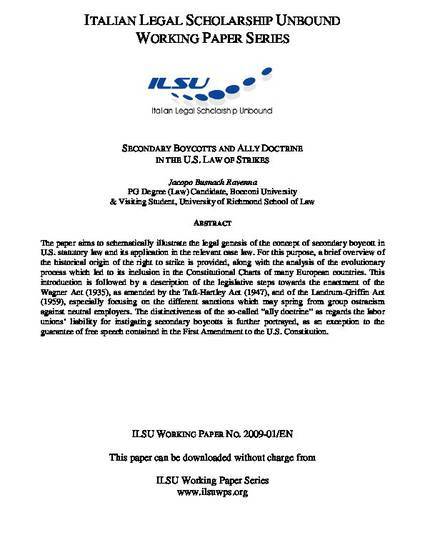 The paper aims to schematically illustrate the legal genesis of the concept of secondary boycott in U.S. statutory law and its application in the relevant case law. For this purpose, a brief overview of the historical origin of the right to strike is provided, along with the analysis of the evolutionary process which led to its inclusion in the Constitutional Charts of many European countries. This introduction is followed by a description of the legislative steps towards the enactment of the Wagner Act (1935), as amended by the Taft-Hartley Act (1947), and of the Landrum-Griffin Act (1959), especially focusing on the different sanctions which may spring from group ostracism against neutral employers. The distinctiveness of the so-called “ally doctrine” as regards the labor unions’ liability for instigating secondary boycotts is further portrayed, as an exception to the guarantee of free speech contained in the First Amendment to the U.S. Constitution.